Do you know how to play MASH? This is a game from the 80’s or maybe even earlier that kids have been playing for years! It is a fun, quick activity to predict your future with 100% accuracy (haha! not exactly but it is fun to test it out). You can print out a FREE MASH game board at the end of this post or draw it yourself on paper. 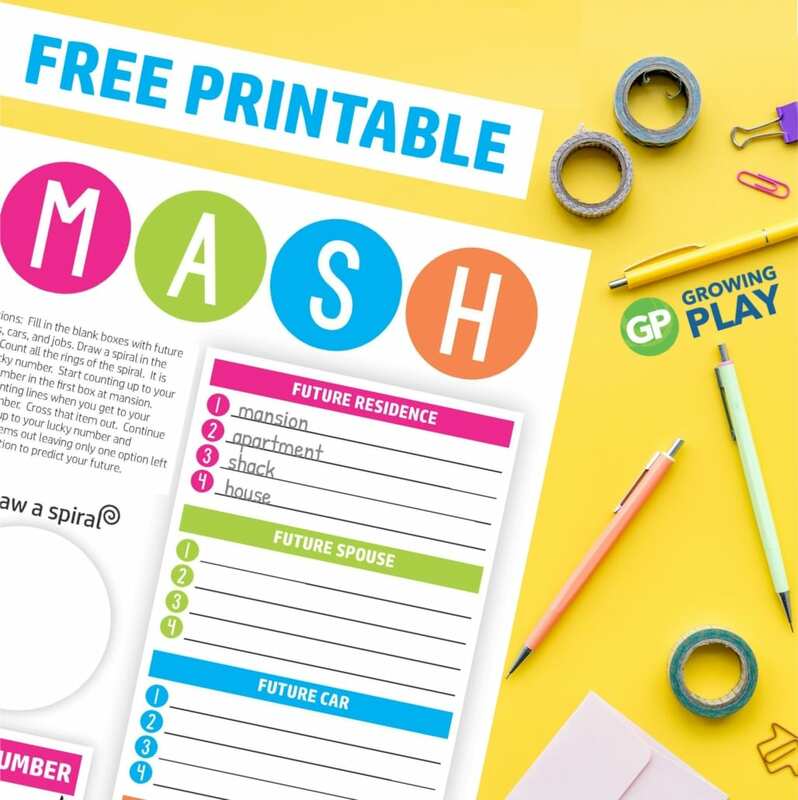 Follow the steps below to learn how to play MASH. To start out, write in your answers for each of the four categories. If you are playing with a friend, you can ask and write down his or her responses to tell their fortune. Write down potential names of who you will marry in the future. Write down 4 different types of cars. It is fun to choose different ones like convertible, pick up truck, sports car or junkyard car. Or decide on your favorite brand name cars. Record 4 possible future jobs for yourself. This can be fun to think up wacky jobs (i.e. lion tamer or dirt bike racer) or more traditional jobs (i.e. teacher or nurse). Next, you need to draw a spiral in the circle to determine your lucky number. You can either just draw it and stop, draw it with your eyes closed, or draw it for a friend and stop when they say stop. After the spiral has been drawn, count all the rings in the spiral. Record your lucky number in the box. The last step is to predict your future. Start counting up to your lucky number in the first box at Mansion. Stop counting lines when you get to your lucky number. Cross that item out. Continue counting up to your lucky number and crossing items out leaving only one option left in each section to predict your future. Where will you live, who will you live with, how will you drive to work and what is your job? Give it a try to see what your future holds. Want Even More MASH Games? 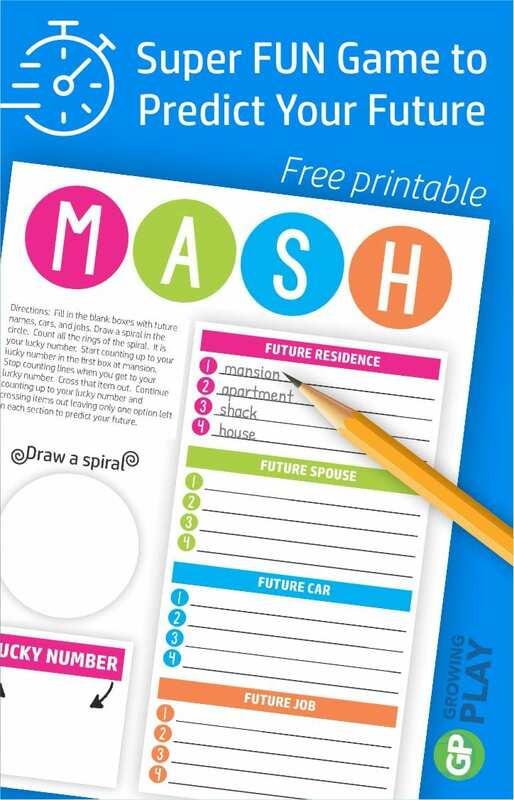 You will most likely find that once kids learn how to play MASH they love it! 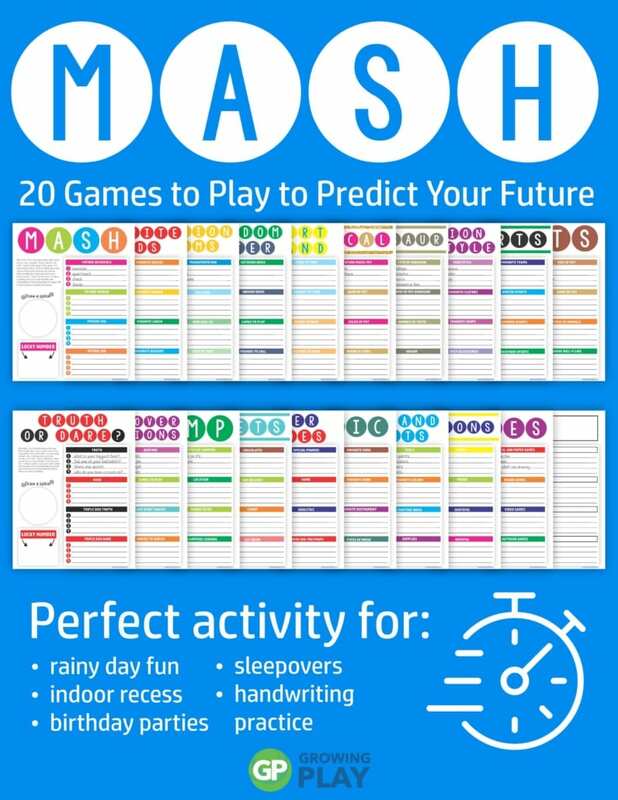 You can keep them entertained with the complete MASH packet that includes 20 games to predict the future! Sign up to receive announcements and the weekly email newsletter from Growing Play. You will be redirected to the link. If you can not see the sign up box email us at info@growingplay.com and reference this freebie. Unicorn Treats – DIY, Cheap, Simple and No Cooking Required Unicorn Maze – Printable and FREE!